In addition to the junior-only clubs, several of the open clubs have junior sections. Cowley and Witney are currently the most active. No cups are currently in progress. The February half term club was fully booked some time beforehand. The holiday club ethos is to keep groups small to allow quality coaching time, so it is recommended people book early to avoid disappointment. From 9.30am to 2.00pm. Open to all with 7 rounds of 10 minutes each with a 5 second increment, ECF Rapid Play graded. This is a 7-round Rapid Play (ungraded) open to all juniors who have not yet qualified for the Megafinal stage of the UK Chess Challenge competition. There will be an ECF graded Rapid Play running alongside it open to junior ECF members. A registration form, including full details and an online entry option can be found at the link below. On Sunday 29 October, Oxfordshire Junior Chess hosted a 4-county girls' chess tournament. In addition to Oxfordshire, the adjacent counties of Berkshire, Warwickshire and Wiltshire took part in the event which was held at Headington Prep School. Matches were played over 8 boards in each of two sections: Under 11 and Under 18. "The U11 girls fought in the most incredibly tight competition at Headington Prep School on Sunday 29th October. Right until the last board had finished of the whole competition, it could have been a 4 way tie on 4 points. In the end, Oxfordshire came 4th, but played some fantastic chess with some super wins by all the players. We'll be back stronger and aiming to win next time!!" "Errr... we won! Comprehensively. " allocated to their relevant section for calculation of the results. numbers of entries and totals of the top 4 scores are given below. previous occasion a clock was presented. The 2013 Oxfordshire junior chess tournament was held on Sunday 3 November at MCS. There were 82 entrants, with a good number in the Under 14 and Under 16 sections as well as the U10s and U12s which were qualifiers for the London Junior Chess Championships. There were a number of good players new to the Oxfordshire chess scene as well as top players from outside the county. Hence the standard of play was quite high, with even some familiar names being edged out of the qualification zone. Full cross-tables and final standings can be found at the link below. Marcus Harvey travelled to Birmingham on Saturday for the British Blitz Championships, an 11-round Swiss with 66 players. After two wins, in round 3 he found himself on top board playing GM Mark Hebden -- and won! A further 1½ / 4 against IMs (as black each time) and a last-round draw with top seed GM Keith Arkell, plus 5 / 5 against the untitled lesser mortals, gave Marcus equal third place on 8 / 11 alongside Arkell and IMs Thomas Rendle and Ameet Ghasi. Hebden won with 9½ / 11, dropping only a draw with Arkell after his loss to Marcus. Full results (cross-tables) can be found by following the links given below. A schools competition is also run as part of the tournament. Subject to not being allowed to win the prize two occasions in a row, the top-scoring schools in Primary and Secondary sections are awarded an engraved chess clock. See the attachment for the rules and full summary of results. The Oxfordshire Junior Chess Championships for 2017-18 were held at Cumnor PS on 6-7 January 2018. * clock prizes awarded to Abingdon School and St Joseph's as Cherwell and MCS were awarded the clock prizes the previous season. Kathryn Gillow (entries & many other tasks), Priscilla Morris (U13/U15/U18 arbiter), John Place, David Zakarian, Elliot Kendall, Marc Ives, Asif Hameed (controllers & pairings - U9 & U11), Ola Murawska & Sameer Kassey (results posting) and probably others I have forgotten [sorry!]. Thanks also to Cumnor PS for providing the venue, Kidlington Congress for equipment loan and Hacketts for catering. www.ecfgrading.org.uk/new/menu.php Standard-play and rapidplay gradings for everyone playing graded games in the UK, searchable by club or by player name. New lists published in January and July each year. www.epsca.org.uk English Primary Schools Chess Association - details of county ('inter-association') and schools tournaments at U9 and U11, and the England U11 team. Site can get rather out-of-date. www.chesskids.com A superb website run by the famous Richmond Junior Chess Club, which offers full chess tuition right from learning the moves up to an advanced standard. All free! www.ecfcoaching.org.uk/ Set up and maintained by John Upham on behalf of IM Andrew Martin, the ECF Manager of Coaching. Includes some interesting links to studies of chess in education. www.testyourchess.com Take the checkmate challenge! Suitable for children and club-strength adult players. www.bjca.org.uk Comprehensive website covering junior chess in Berkshire. Check out in particular the Saturday Afternoon Events, low-key tournaments on most Saturdays in the season. www.oxfordfusion.com/epsca Detailed results from the inter-county competitions held by the English Primary Schools Chess Association. www.hertschess.com/juniors.htm The junior section of the Herts website. Lots going on in this active county. www.rjcc.org.uk/teams.htm The Richmond EPSCA team are all members of Richmond Junior Chess Club. www.sussexjuniorchess.org Website for the very successful Sussex team. www.weyvalleychess.org Wey Valley are usually right there at the top of the EPSCA events. www.wiltshirejuniorchess.co.uk Keep up with our western neighbours. Look out for details of the high-class Wiltshire Junior Congress, usually in February / March. www.ljcc.co.uk High-quality event played each December. Qualifying is necessary for the U12 section and below, at tournaments through the autumn. www.ukchesschallenge.com The biggest chess tournament in the world, with tens of thousands of entrants! Submit entries via schools in January. Internal school tournaments lead to county Megafinals in May and North and South Gigafinals in July. If your school plays in one competition, this should be it. Oxon_2016-2017_U18.pdf Entry form for Oxfordshire Junior Chess Championships 2016-17. A Standard Play tournament to be held on 7-8 January 2017. Oxon U9 and U11 trials 2017.pdf Invitation/entry form for Under 9 and Under 11 Oxfordshire EPSCA team trials in January 2017. Oxon U9 and U11 trials 2017.docx Invitation/entry form for Under 9 and Under 11 Oxfordshire EPSCA team trials in January 2017. 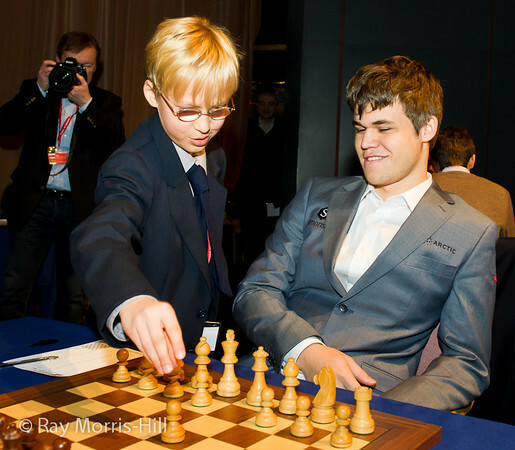 Seb makes Magnus Carlsen's move! Seb and Magnus.jpg Oxfordshire junior Seb Watkins was selected to make Magnus Carlsen's opening move in the last round of the London Classic. What an honour, and at the historic tournament where Carlsen broke Kasparov's all time grading record. Seb suggested d4 (as can be seen) but after the photographs ended Magnus elected to play 1.e4 and drew a fine game with Vishy Anand. Well done Seb, I hope you enjoyed it. RightMove21.pdf Issue 21 of The Right Move, a junior magazine published by the English Chess Federation, includes an article on the junior tournament run by Witney Chess Club in October 2008. Graders Report 2017.docx A table showing events submitted to the ECF. junior report 2011-12.pdf Report from Junior Liaison Officer to the 2012 AGM. 2010_JuniorReport.doc Report from Junior Liaison Officer to the 2010 AGM. 2009_JuniorReport.doc Report from Junior Liaison Officer to the 2009 AGM. 2006_JuniorReport.doc Report from Junior Liaison Officer to the 2006 AGM.